I’m having one of those rare moments, I’m sipping a Lambrusco with an oenophile. I say this because these Italian sparkling reds can be quite rare to find (many people aren’t even aware they exist) and, they seem to have fallen out of fashion 20 years ago. These are precisely the reasons why I love them; they are the lesser known gems of taste. Less fizzy than champagne and lighter than an actual red, I find a Lambrusco is a good starter wine, the perfect accompaniment to most meals, and great with dessert. It’s an easy wine that still has some texture to it. If Paul Choueiry, my fellow wine sipper, agrees, he doesn’t say so right away. Understandably — since he is somewhat of an expert and not all Lambruscos are high quality — but one thing is clear, he is happy to pour me some. And, he takes pleasure in those who enjoy their wine. 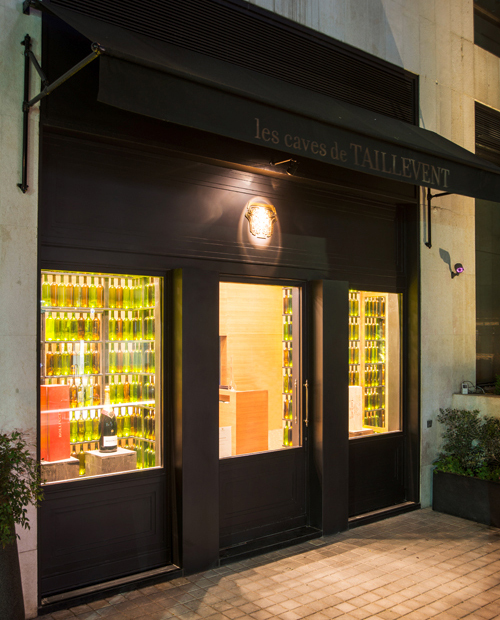 I first met Choueiry at a wine pairing (and tasting) event a few months ago for the prestigious Château Palmer at Les Caves de Taillevent, where we are chatting today. Then, we tried various velvety and fruity bouquets by Palmer, from their full bodied, expressive 2005 Alter Ego label to the more complex Château Palmer 1995 vintage and the subtle, precise and refined 2001 and 2005 bottles, which rolled on the tongue like silk. With restrained tannins, generous compositions and a hint of spice, they were remarkable wines, evolving richly with the food. Until then, the only restaurant in Lebanon that I knew had wine pairings was the upscale Burgundy. 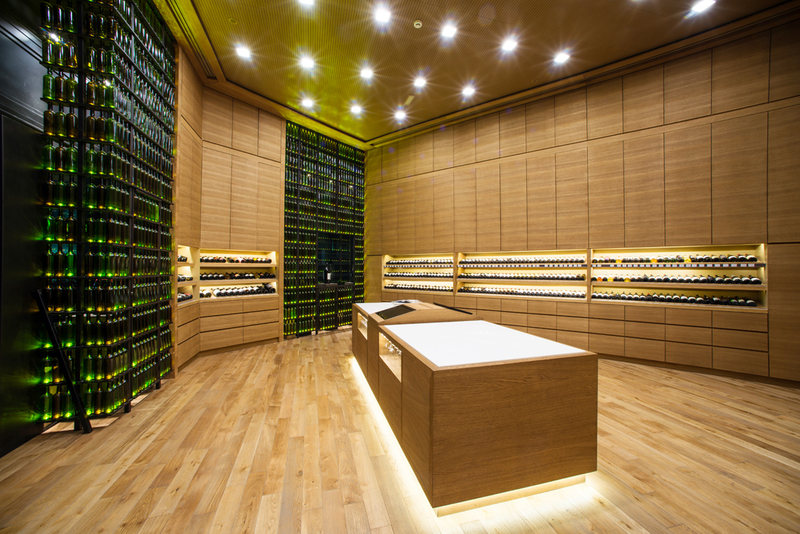 But Les Caves de Taillevent offers much more than that — not just a wine shop and wine pairing restaurant, it also serves as (what they call) an academy for winemaking and appreciation classes, which comes in handy since this is a veritable wine cellar of 1,600 labels, the vast majority of which are French. Also, Beirut is the only outpost in the Middle East, since March 2013; Taillevent’s birthplace is in Paris (where the restaurant also received one of the very first Michelin stars in the 1940s, and then two more before it lost them) and it has another branch in Tokyo. If we are to go back to why I’m sampling a Lambrusco with Choueiry, it’s because I’m listening to the story of how he ended up here — here, in the nonliteral sense. To the observer, Choueiry’s journey into becoming a wine connoisseur could be obvious. He tells me his grandfather was actually a winemaker, who launched Clos St. Jean in Chtaura after learning the trade in Argentina, and opened a wine bar on Foch Street in the 1930’s. On a whim, he applied to the University of Burgundy in Dijon, after completing his pharmaceutical studies at the Lebanese American University in the late 1990s, and he got in. “I was one out of five non French who did [get in], among 489 applications. When these things happen, you simply stop asking questions.” His degree would be in Oenology, or all aspects of winemaking and production. 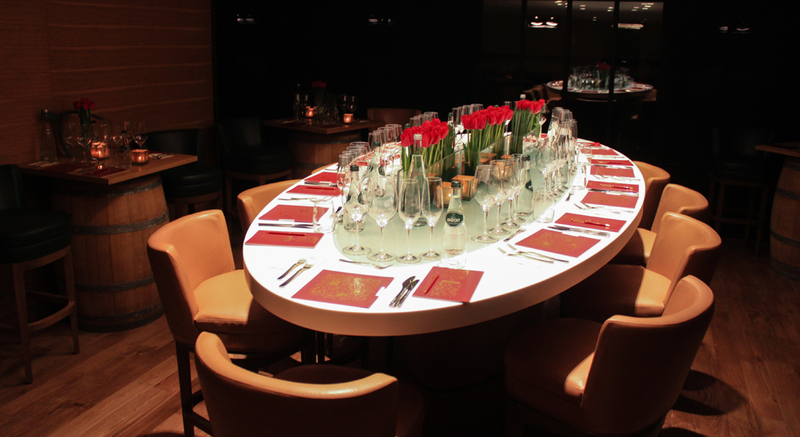 “The sommelier is only a part of this,” Choueiry explains. It is a much more holistic kind of knowledge. “For example, you would learn things like since 2010–11 was a warm summer, there was lots of alcohol in the reds of that year, and the whites were destroyed by the heat. You could appreciate the impact of such challenges on wine and all the factors involved in the making of…” We go off on a tangent about how warmer climates are bad for grapes because of the level of maturity they reach before harvest — the sugar becomes ethanol — which is why many of the Lebanese wines can taste quite young, and why you need harsher soil and climate conditions for really mature wines. Perhaps too ambitious a project, the wine bar soon became a pub, to cater to the general public’s tastes. And in 2004, Choueiry found himself with a proposition from the Beirut airport’s duty free department to create the foreign wine category and to turn $14,000 worth of wine into $2 million. At the time, the taxes on imported wine dropped by a whopping 50 per cent, a good opportunity to gain market share. His position later evolved to see him take over the whole alcohol section (including local wines) and liquors. 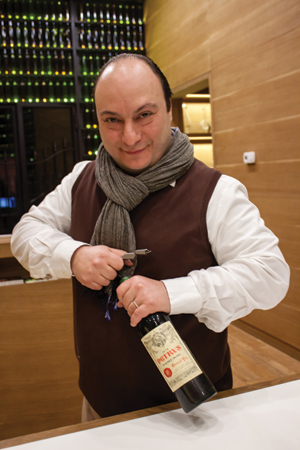 It was five years later, when he became a unit buyer for the prominent Lebanese distributors Fattal, also for foreign wines, that he proposed bringing Les Caves de Taillevent to Lebanon, with their help. This collaboration, he tells me, enabled him to handle the retail and distribution side of the wines as well. The need to add good food to the mix only arose last December when Choueiry decided to join forces with Lebanese chef Maroun Chedid (before, only charcuterie, foie gras or salmon was offered at the wine bar). When I ask him why he chose Chedid, he explains how they initially worked on a Christmas menu and, “It was like, you know how crazy minds meet. I mean, he cooks the Joues de Boeuf (Beef Cheeks) for 60 hours in order to conserve the flavor.” I didn’t believe it until I got a chance to taste it for myself. When I wondered aloud at the dissolving meat’s intense succulence, Chedid pulled out one of his beef bags to show me how he cooks each piece, enclosed, at 66 degrees, and yes, for 60 hours. 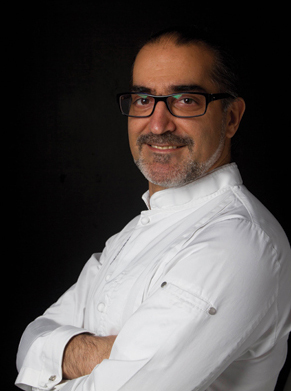 Though very much self trained as a chef (he studied hospitality primarily), Chedid has a few awards under his belt, such as Chef of the Year (2013) by Les Toques Blanches du Monde, and he has collaborated with Michelin starred chefs, such as his seminar with Alain Ducasse on Mediterranean cuisine. He also has a slew of good local restaurants attached to his name, like Gilt, among others. You could say he is a bit of a purist. He slow cooks basic ingredients to reach the ultimate intensity of flavor or works with raw food, such as octopus carpaccio slices, by simply dipping them in a bit of olive oil, lime and yuzu. And Chedid does take seemingly simple starters to another level, like his tomato tatin (cooked for four hours) that bursts with surprising juice, topped with goat cheese, or the more traditional ravioli, rich in truffle and toasty beurre noisette (a nutty, caramelized butter). Willing to push some boundaries, he is known for adding truffle even to his kibbeh nayyeh for example. With the seasonal menu he has created for Caves, accompanied by a high caliber of wine and sommeliers’ well informed recommendations, it’s the perfect balance between the classic and the creative in fine dining. There are so many items that stand out, it would be difficult to pick just one. Which reminds me of how, when our conversation was drawing to an end, I asked Choueiry if he had a favorite wine. He responded with another question. Could I say what my favorite song was? I couldn’t. “It’s the same for wines, it really depends on the situation you find yourself in.” I tried to push him to at least give me a favorite red, because I believe they are superior to the whites. “For you to have a great Pinot Noir Alsace with a pizza, that would be crazy, and fantastic. But some whites are orgasmic,” he says, “Every moment has its bottle.” As I leave the plush interior furnished with blonde wood, wine barrels for tables and stacks of gleaming dark bottles, I cannot help thinking how well he summed it all up.